The Least Flycatcher is a small, drab flycatcher that reaches near the southern limit of its breeding range in the highlands of northeastern Tennessee. As with other members of this genus, it is best identified by song, a harsh two-noted che-bek. 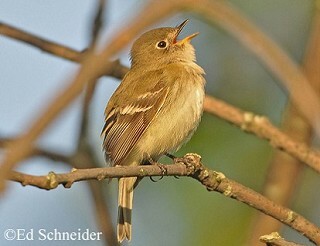 Unlike other Empidonax flycatchers, it is more likely to sing during migration and has been reported across Tennessee in the spring. The breeding range extends from northeastern Canada to the Atlantic coast, southward through the northern United States, New England, and along the Appalachians. It spends the winter in southern Mexico and Central America. Description: This small flycatcher is olive green above and whitish green below. It has a prominent eyering, and two white wingbars. Males and females look alike. Voice: The song is a harsh, emphatic two-noted che-bek. Empidonax flycatchers all look similar and are best distinguished by voice. Habitat: Breeds in semi-open woodlands, woodland edge, orchards, and shrubby fields. In Tennessee, Least Flycatchers have been found in open beech-maple forests, mature beech forests, and forest edge, also open groves of Virginia and Shortleaf Pine, a mature cedar grove, and an apple orchard. Nesting and reproduction: Males establish their small territories in highly dense clusters. Clutch Size: Usually 4 eggs, with a range of 3 to 6. Incubation: The female incubates the eggs for 13 to 14 days. Fledging: Both adults feed the young, which fledge in 12 to 16 days. Nest: It takes the female 6 to 8 days to weave the compact cup-nest from fine grasses and weed stems, and line it with plant down. The nest is usually placed in the crotch of a small tree or shrub 10 to 20 feet above the ground. Status in Tennessee: Least Flycatchers are a locally uncommon summer resident in northeastern Tennessee, generally between 2,500 to 5,250 feet elevation. They are uncommon during migration across the state. In spring, migrants arrive in late April and depart by late May, and in fall they are present from late August to late September. In areas where Least Flycatchers are more common, the males will establish small territories in highly dense clusters that resemble classical leks. The oldest known wild Least Flycatcher was 8 years old. Best places to see in Tennessee: Roan Mountain, Great Smoky Mountains National Park. Tarof, S. and J.V. Briskie. 2008. Least Flycatcher (Empidonax minimus), The Birds of North America (A. Poole and F. Gill, eds.). The Academy of Natural Sciences, Philadelphia, PA, and The American Ornithologists' Union, Washington, D.C.